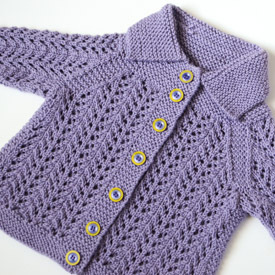 Somewhere between here and there, I knit this sweet cardigan for the daughter of a dear friend. Pattern: primarily, it’s a sized-up version of the Baby Sweater on Two Needles (aka, February Baby Sweater) from Knitter’s Almanac by Elizabeth Zimmermann. 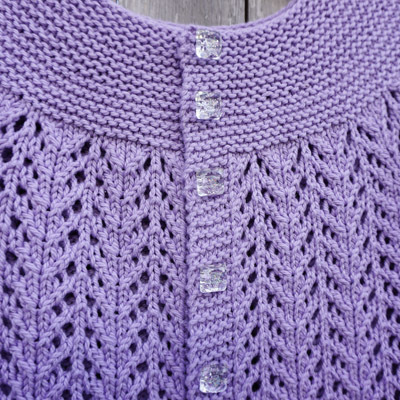 For sizing, stitch counts, etc., I used the Hyphen sweater by Lisa Chemery for guidance. Yarn: Spud & Chloe Sweater in lilac (7523), a total of about 3.5 skeins, 550 yards. 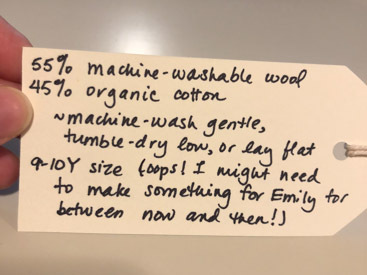 This was my first time using the wool-cotton blend, and it’s quite lovely! I hope it holds up well in this lace pattern and doesn’t stretch too much. It felt like it could block out quite well if I pulled it, which is not necessarily the best for a sweater. On the other hand, the yarn is machine-washable and -dryable, so hopefully that keeps the shape in check. My favorite part of the sweater has to be the buttons! They are rounded cubes with glitter in the middle. A little chunky, a little showy, but I just love them! Lastly, I wanted to mention that this sweater is the “upgrade” to the teeny-tiny Inky Dinky sweater I knit 5 years ago. Emily’s mom recently texted me a pic of Emily still squeezing herself into the Inky Dinky, even though she’s 5 years old and the sweater is for a 3-month old. Nothing warms my heart more than a grateful recipient, so I quickly made it my mission to knit her an upgrade! I think this big girl upgrade will do! Looks lovely! How nice to have a truly knit-worthy person to receive the fruits of your talent! I have never heard of wrap and turn to close the wrist like that. When I made the February sweater, I did the sleeves in the round.